2) the jam and the "load paper" lights are blinking. 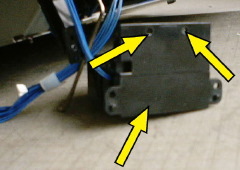 The problem is issued from a contact which, theoritically, has to be done by the cartridge's small nail (lowest yellow arrow) onto the switch (highest yellow arrow). 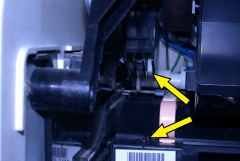 2) add a thickness onto the cartridge's contact nail: same operation to be done for each new cartridge??? 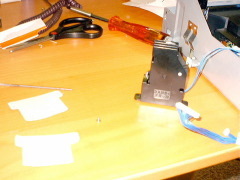 3) add a thickness under the switch itself. 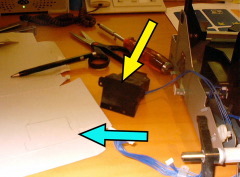 I decide to put extra thicknesses under the switch (see yellow arrows to locate where I put the thicknesses). ...on which I have to make holes for the screws and spurs! 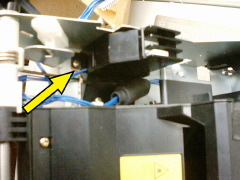 The shims pointed by the arrow when the switch is back in place. Even if it is difficult to dissamble (and re-asemble) the machine, the small pieces of cardboards helps you to nearly save 250 euros!